How to build a Arduino Faire Strenght Test with Arduino, NeoPixels and The Tactigon Skin (T-Skin). Fun example to use accelerometer and Bluetooth. The Tactigon Skin does not only ment work, but also FUN! 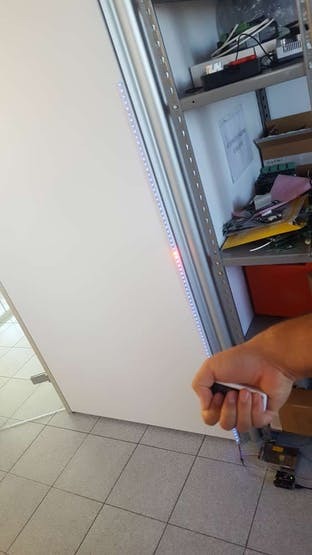 With this little project we connected our hand movements to a NeoPixel strip. An Arduino UNO is connected to the strip and, with an HC-05 Bluetooth module, to The Tactigon Skin. This is only an example of LEDs control with T-Skin, you can use other movements, patterns and other NeoPixel strips if you want! As said, Bluetooth Low Energy is the radio we used to connect the T-Skin to the Arduino UNO. Tactigon Skin is provided of a Bluetooth Low Energy radio so you don’t need any other “shield” or breakout board for this device. Arduino UNO, on its side, does not have Bluetooth Low Energy communication, so we used an HC-05 module for this purpose. NeoPixel strip is connected to the Arduino UNO with jumper cables, linking Arduino’s pin 12 and GND to NeoPixel’s signal and GND. The Power Supply used is a 5V 50W switching. Tactigon Skin’s sketch waits for button 1 press. When this button is pressed, it starts sampling @50Hz, until the buffer of 350 samples is full. The buffer is filled of T_AccData structures, each of them containing x, y and z components of the acceleration. Find the sample with the maximum acceleration: this means to find the maximum of the sum the absolute value of the 3 components of each sample. This is potentially the highes acceleration reached (but could be both at start or end of the shot, when starting movement or stopping the arm) in this strength test game. 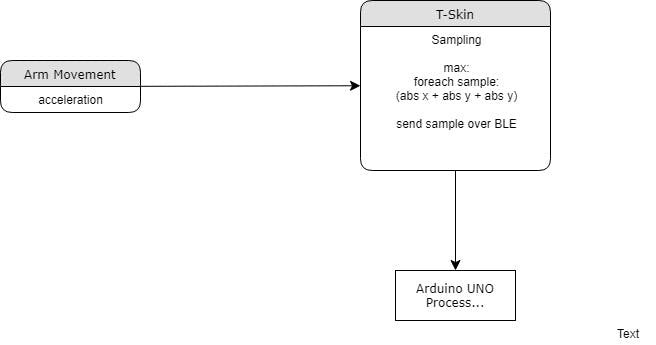 This sample is sent over Bluetooth Low Energy to the Arduino UNO, for further processing. 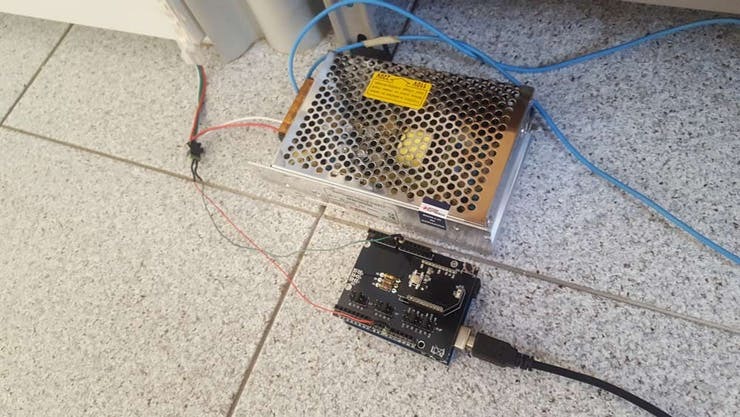 As soon as the Arduino UNO receives the sample, it starts the process to compute the “score”. The score is computed by finding the maximum of the 3 components received, and scaling the component (it has a maximum of 156.8 m/s^2 when using 16g fullscale on the T-Skin). Once scaled to our LEDs number, this value is used to start the “Knight Rider” effect provided by this library, we thanks the author (Brett Walach, technobly)! We slighty changed this algorythm, only to have a blue background of LEDs instead of no light at all. Thanks to its programmable core, The Tactigon Skin can be used for work, educational purpose or fun! Follow us on Hackster.io for more projects about T-Skin and Tactigon ONE! Meanwhile, enjoy your brand new Arduino Faire Strenght Test!